Back in the 1970’ or 1980’s when my mother first discovered this recipe in a Ma Bell (Telephone Workers Cookbook, she was given as a gift) she thought she had to make this just because it was so different. In addition to wanting to try this new recipe, she was tired to making fudge with a limited success rate, yes even for people that bake and cook all the time fudge can be Rocket Science, either you end up with a fudge to spoon, or something that may require the use of a saw’s all, jack hammer or other concrete busting device. In addition, this recipe provided people with the ability to give something good to people en-mass without breaking the bank to give co-workers over the holidays. The main purpose of the Velveeta is “BULK” to increase volume, something which actual fudge has none of (Chocolate, Cream, Butter, Sugar) and in most cases “PRAYERS”! 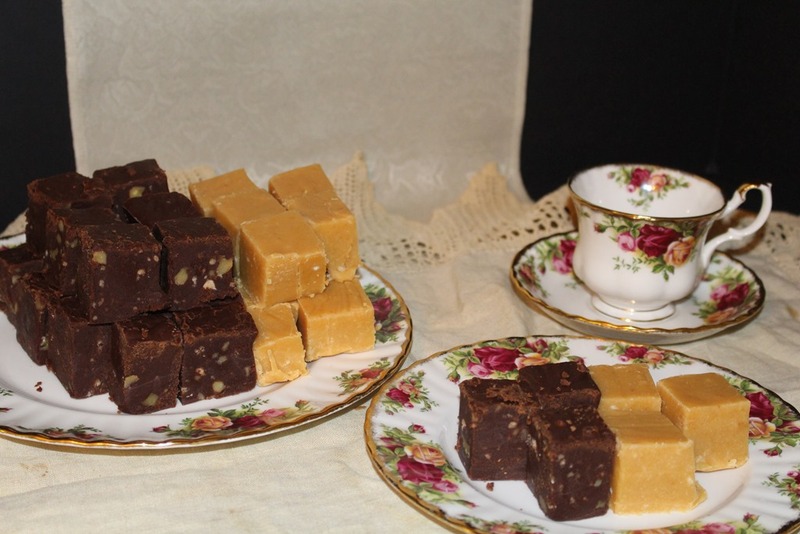 My mothers favorite fudge however was Peanut Butter Fudge, more often than not she would test several different recipes a years, taking out news paper & magazine clippings of recipes, cookbooks etc. as we always did with all recipes, scanning them all to see what different ingredients (if any) could be found and then we would take those recipes and make our own recipe. Peanut Butter Fudge also had a much higher success rate than chocolate did, in coming out with the smooth creamy yet firm consistency it was supposed to have. This recipe can easily be cut in 1/2, this recipe make approximately 7 pounds of fudge. I used a pyrex 11 x 15” large casserole dish and my fudge was approx. 1 1/2 inches thick. (I experimented with a small batch and left out the nuts and put in 1/2 cup of Craisins, it tasted so close to a Cadbury Fruit and nut bar (I only used the Craisins) the flavor of the craisins with the dark chocolate was out of this world) I would definitely when making this full recipe use 1 1/2 –2 cups of Craisins! Over the years I have discovered a couple of things about making this fudge, do not attempt to rush it. I used an 8 quart stock pot and a heavier stainless steel long handled spoon to stir it with. Also I have found that putting all the ingredients in the pan (except the sugar) and setting the electric stove unit to between 3-4 and slowly melting and stirring the ingredients occasionally until fully melted, then increasing the heat to between 4-5 and starting to add the powdered sugar cup by cup, make the job a lot easier. At the time you start to add the sugar, you will notice on both chocolate and peanut butter fudge the ingredients in the pan will “break” or look like a curdled mass swimming in melted butter (Do Not Worry) as you add the sugar and stir at about the third cup of sugar it will all come back together into what is starting to look like fudge. As you get up to half of the sugar into the recipe increase the heat to between 5-6, and stop! do not put the heat higher or you will have sticking, burning or scorching going on (not good). This way of preparation acts more like a double boiler, continue to add your sugar cup by cup and stirring until you have reached a silky pourable consistency. Pour into your buttered or parchment lined baking dish and allow to cool at room temp. Then put into the fridge to chill. It is easier to cut into squares if you remove from the fridge and allow to come to room temperature. Use recipe as above, instead of chocolate, use 8 oz. peanut butter (I used 1 pound) and proceed with the recipe. I used fresh ground smooth and creamy peanut butter from the Mennonite Bulk Food store, I feel that you get a much better peanut butter flavor vs. using a hydrogenated peanut butter. It has been suggested but I have not tried it yet, that in place of Vanilla to use several tablespoons of a Liquor, such as Gran Marnier, Chambord, even a cream liquor. which would impart a dark chocolate/orange, dark chocolate/berries etc flavor to your fudge. NOTE- Cold Oven means DO NOT PREHEAT YOUR OVEN! 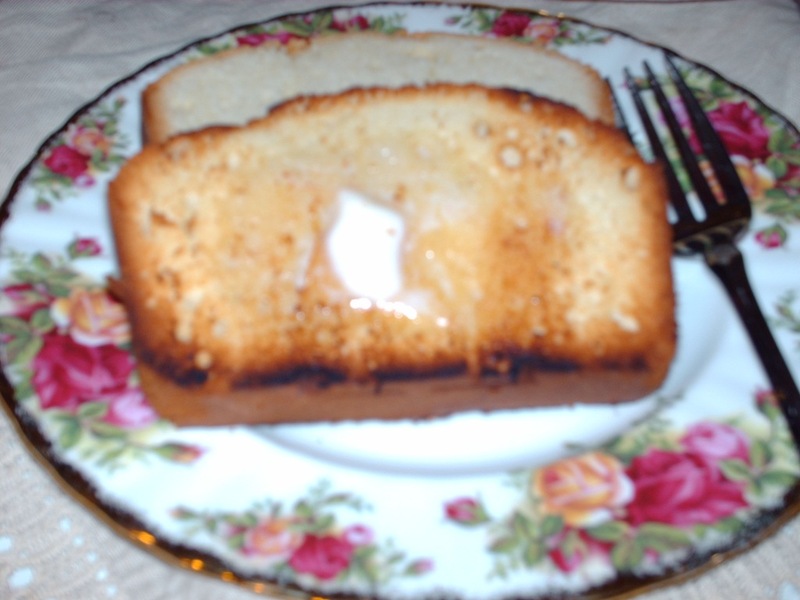 The cake is baked from a cold oven. I never knew why exactly but from what I have found on the internet that denser cakes have a finer grain, crumb, and texture when started in a cold oven. 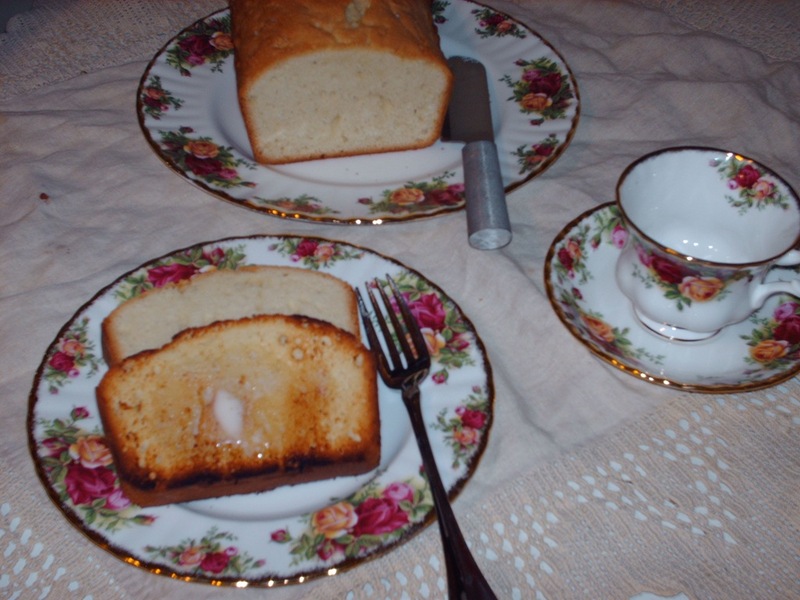 Lately I have noticed on the blog statistics many searches looking for Old Fashioned Pound Cake, Real Pound Cake, A pound of everything cake and the search terms are endless. 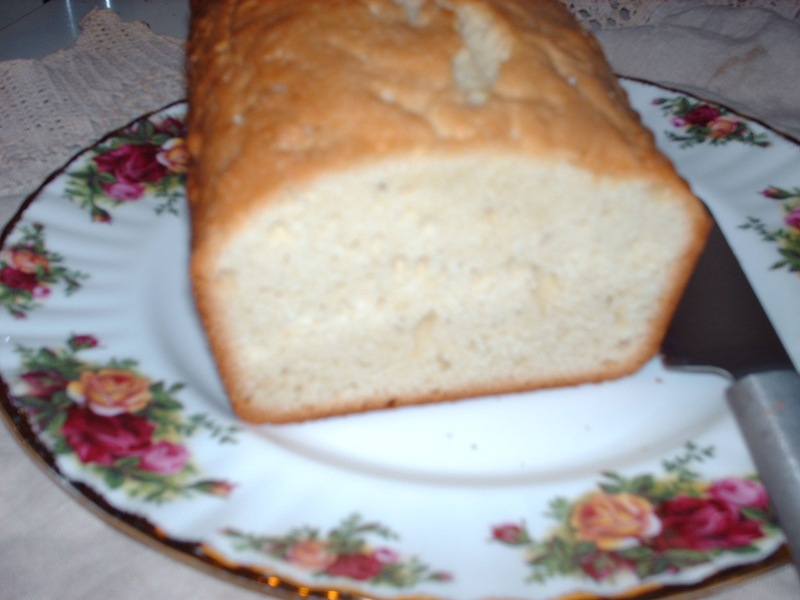 Having grown up in a home where we made the “Old Fashioned “Real” Pound Cake I decided since I had everything at hand, it was time to make a real pound cake. Which is one of the simplest cakes that you can make. This is a heavier dense pound cake, which uses NO Leavening what so ever, it rises from the volume of air that is beat into it. As you might have guess already your grandmother had some really good arm muscles built up to make this cake, well before the invention of electricity or electric mixers it was all done by hand. As you might guess again, I do have a Kitchen Aid Mixer, and you are certainly right in guessing this was NOT mixed by hand! My mother told me years ago (as in 4 decades) that this was the first cake that young girls learned to make, because it was easy to remember. To make this cake it is as simple as pound of everything. Butter, Eggs, Sugar and Flour, a pinch of salt, dash of vanilla, and mace or nutmeg, I used freshly grated nutmeg. 8 Eggs (Large) 7 Eggs (Extra Large) this is what I keep on hand. Add your Eggs one at a time beating on medium speed for about 1 minute each, this is what helps to incorporate the air into the cake, in place of leavening. Once all of the eggs have been added, add 1 – 2 teaspoons vanilla (depends on preference) add the pinch of salt probably about 1/4 teaspoon, could be 1/2 teaspoon if you used unsalted butter. Slowly add flour in 1/2 cup measures, stirring speed to avoid flour flying all over, and gradually add flour like this until all is incorporated. You can make this cake in a large 10” tube pan (very nice stately looking cake) or in two loaf pans, (I used loaf pans this time) and will explain why at the end. Either Grease and dust with flour (I greased with my butter wrappers) and dusted with flour, you could use PAM or other spray coating. and dust with flour. 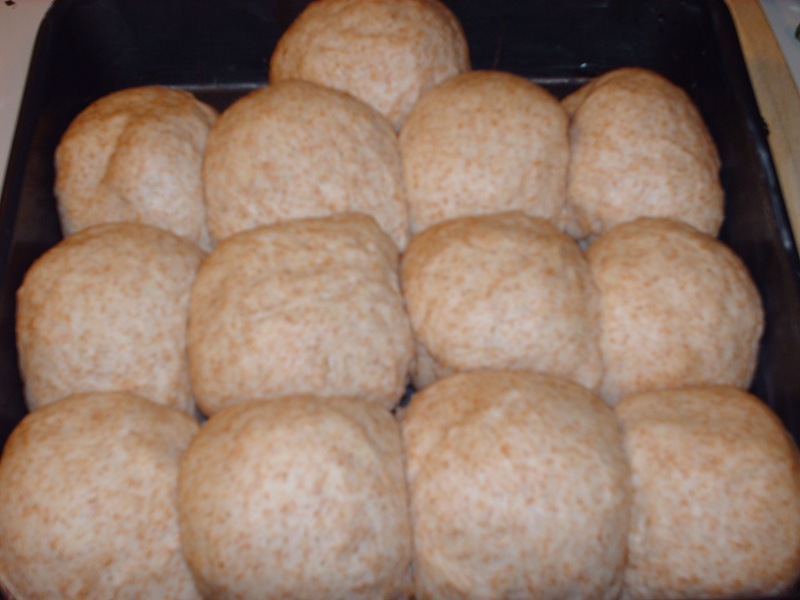 LOAF PANS– the baking time will be about 1 hour (check at about 45 minutes to see how they look as every oven is different. TUBE PAN– set batter filled pan in COLD OVEN, and bake at 325 degrees for about 1 1/2 to 2 hours (once again all ovens are different and you will want to check at about the 1 1/2 hour mark, and go from there. What you are looking for is the top will ridge up and break, the cake will be a light brown and insert a knife in the center of the ridge and when it comes out clean it will be time to remove from the oven. Place the pans on a wire rack and let cool for approx 20 minutes, then remove from pans, or if using the tube pan, it is helpful to run a long knife around the tube, before turning upside down. This cake is better after it sets for a day, the flavors develop and the cake becomes more moist. I used loaf pans this time because as a child my Mothers favorite way to have a slice of this cake was to slice about the width of a slice of bread and then place a slice in the toaster, and it will brown slightly and serve with butter (like you need more butter) but this was very good. I have found that sometime if you have a toaster oven this works better as the slice is not as large in size as a slice of bread. This is also good with either season fruit on top of it (such as strawberries) or other fruits, but it is great alone! Do you ever get in the mood for things you should not have?, For instance a nice bowl of vanilla ice cream (my favorite is French Vanilla) with luscious Hot Fudge Sauce gracefully flowing down over the scoops of ice cream? What a treat on these hot days of summer! Well I have to tell you I do, however over the years since all the fat free craze has simply ruined the ice cream topping that you can buy in the stores. I know my favorite of the past was Evans brand Butterscotch, that was back in the day when they actually used butter in their sauces, I do believe those days are gone forever now. I have not bought store bought in years. Also a note here, my mother loved it with semi-sweet chocolate, I have made it that way, as well as 1/2 semi-sweet and 1/2 unsweetened, I have also made it with Dark chocolate, this is a recipe that you can experiment with the ingredients to find what you like. This can be frozen and when ready to use thaw and heat what you want in the microwave. So often you are not in the mood or a biscuit or toast, you just want something bread like and homemade. 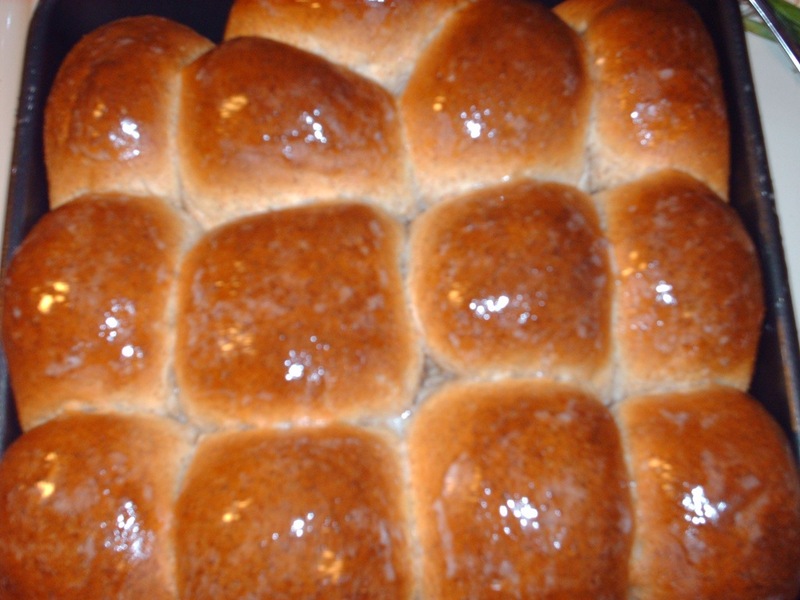 Quick Yeast Rolls, well are not quick like biscuits, they are not quick like frozen rolls from the store either. This recipe can be made with all white or unbleached if you prefer, however we all need fiber in our diets and the addition of the whole wheat gives you that and still makes a nice light roll. Place the flour (s) in the mixing bowl, and whisk or stir with flat paddle of the Kitchen Aid to blend. Take flat paddle off and put dough hook on. Take very warm water (my hot tap water seems to be the correct temp) and put the sugar, and yeast in , stir to dissolve yeast, allow a few minutes to make sure the yeast is working. Add melted shortening and salt and stir. Add to flour, and mix on stir speed (you may need to move the flour with a spatula into the yeast mixture to help the dough hook start mixing. Remove from oven and brush tops with butter (I save butter papers for this) rub over surface to grease tops. This looks complicated, but it is not, when you get used to doing it. Depending on the size you choose to make the rolls you will end up with 9-12 rolls, as you can see I ended up with 13.